GoPro shares are getting crushed following a report that said a GoPro camera may have been responsible for the seriousness of the skiing accident involving Formula One driver Michael Schumacher. In early trade on Monday, shares of GoPro were down as much as 10% amid another day of broad market weakness, with the Nasdaq losing the most ground among the major averages. According to Yahoo Sports, French F1 commentator Jean-Louis Moncet told radio station Europe 1 that the problem for Schumacher was not his fall but the GoPro camera he had mounted to his helmet. This is not the first time that a mounted camera has been pegged as possibly increasing the severity of Schumacher’s injury, but it appears to be the first time GoPro was mentioned by name. A report in The Telegraph from back in February, shortly after Schumacher’s accident, said that Schumacher’s helmet smashed after his fall, but that the camera mounted to his helmet did not. 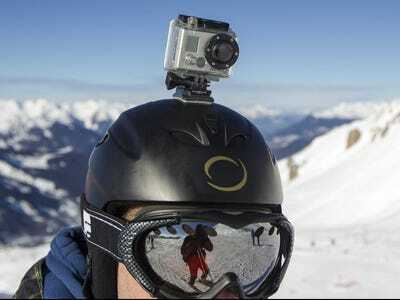 The helmet smashed — but the camera he had attached to it, in order to record him and his son skiing, was undamaged. The footage, audio and visual, has provided police with crucial information about the crash. Schumacher, a seven-time world champion, is still recovering from his injuries, sustained in December. Schumacher emerged from a medically induced coma in June.